Our motocross track is open daily throughout the entire year, and riders are always welcome to come ride on it! Throughout the summer months, the track is frequently groomed, but during the winter months, we will not be grooming the motocross track at all. Riders are welcome to come and ride on the track all winter long, but the motocross track will not be groomed again until spring. Haspin Acres has two mud bog pits for your mud splattering pleasure! Our smaller mud pit, the "Challenger," is a little easier to cross than our larger "Eliminator" mud pit. The "Challenger'' pit is perfect for Quads, Bikes, UTVs, and smaller vehicles, and the "Eliminator" pit is best for the Big Trucks and larger vehicles. Whether you are running in one of our Mud Bog Races or just playing in the mud, our mud bog pits are a mud lover's dream! Our Drag Strip is a 300 foot long loose dirt race track. Our flat drags are run with official PortaTree timing equipment, and ALL vehicles are welcome to enter - ATVs, UTVs, quads, bikes, buggies, trucks, four wheelers, hand crafted dirt dragsters, and everything in between. Haspin Acres runs true Bracket Drag Races as well as "Run What You Brung" and Outlaw Drag Races. Trail Riding at Haspin Acres is something that everyone can enjoy! 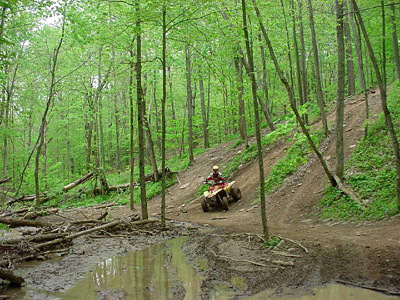 With hundreds of miles of trails winding through trees and over hills and valleys, through streams and creeks and over rocky crags, riders of any skill level can successfully find a challenge. The ultimate conquest is the "Devil's Backbone", a customer favorite! * Please note that there is NO NIGHT RIDING at Haspin Acres from 10pm to 6am.